Academy sponsors Coca-Cola and PepsiCo often pat themselves on the back for “being part of the solution,” providing “healthful choices”, and helping people lead healthy lives. Okay, then. 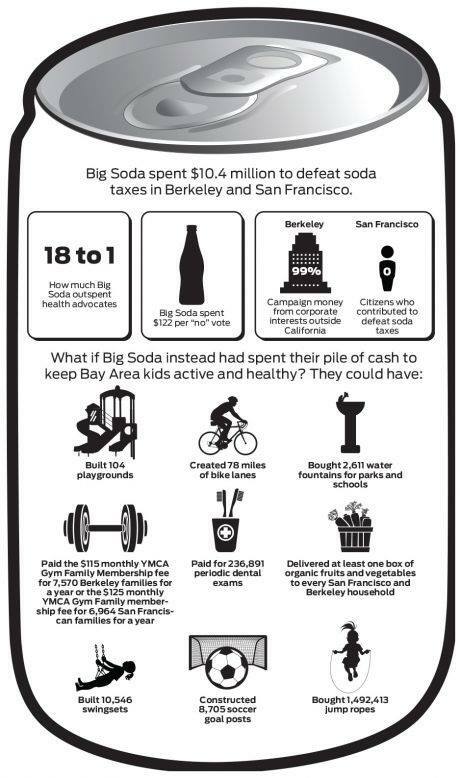 The San Francisco Chronicle drafted this excellent infographic (and accompanying commentary) which takes a look at what Big Soda’s $10.4 million spent to fight soda taxes in the Bay Area earlier this month could have bought to actually benefit public health. Actions speaker louder than words. And, consistently, the soda industry’s actions show that public health is an afterthought at best.